Beets are particularly recommended as part of a healthy, diversified diet. While their sugar content is higher than that of other vegetables, it remains moderate and should in no way discourage people from eating them, especially since they are packed with essential elements required for a balanced physical condition. - Vitamins: beets contain numerous vitamins, especially from the B and C groups. Note its high vitamin B9 or folic acid content (for cell division and maintenance), which supplies up to 37% of the recommended daily intake. B9 deficiency can cause fatigue that could lead to anaemia. - Minerals and trace elements: beets contain a host of minerals and trace elements, including in particular potassium, magnesium, calcium, iron and phosphorus, as well as manganese, copper and zinc. - Fibre: helps facilitate intestinal transit, slowing down and adjusting the assimilation of carbohydrates. Cooked beet fibre is better tolerated by those with sensitive digestion. - Antioxidants: red beet is often mentioned as one of the vegetables that have the highest antioxidant power (through components that protect our cells from damage relating to oxidation stress, and thus help reduce the risk of age-related disease like cardiovascular problems, cancer etc.). 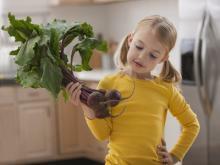 The beet’s antioxidant power comes from pigments found in large amounts and called betalains. For a healthy life, eat 5 fruit and vegetables daily… including red beet! Sports enthusiasts are particularly fond of red beet for its high vitamin and antioxidant content (because of hyperventilation). But that’s not all. 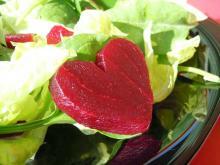 Scientists have been looking into a possible link between red beet and sports performance. They have found that eating red beet could help improve endurance by reducing muscle oxygen consumption! Nevertheless, we remind you that the best way in which to improve your sports performance is to always have a healthy, balanced diet, a healthy lifestyle and some physical exercise! Now, to your running shoes everyone!